When someone has been diagnosed with dementia it is an upsetting time for the individual and for those close to them. If the person has been diagnosed with younger onset dementia they may still be in full employment at the time of the diagnosis. They may still be responsible for a family and have a mortgage or other financial responsibilities. Dementia affects people differently. A person may already experience some problems in their job, or they may be coping really well. However, sooner or later their abilities will decline and they will need to consider leaving employment. Many people find it helpful to talk to other family members and carers of people with younger onset dementia. 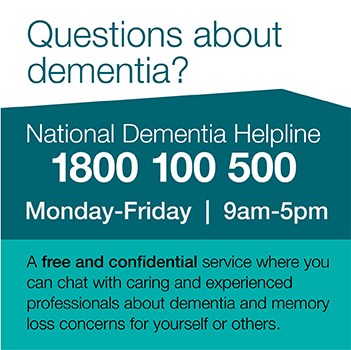 It may be possible for Dementia Australia to put you in touch with other families and carers or link you to a support group. If a person with dementia decides to keep working you will need to consider how best to support them. Help them to think about how to talk to their employer about the diagnosis. This is a very big step, so planning what to say and how much to tell is important. Rehearsing can be helpful. You may also want to suggest they take someone along to help explain their situation, and to offer support. Keep planning for the time that they will need to leave work. If you work, find out about your entitlements for carer leave and sick leave. Remember, any problems at work may well be the result of the dementia and the person with dementia may not have control over these. Like anyone with a serious illness, people diagnosed with dementia are entitled to special consideration in the workplace. The person with dementia may decide that it is best that they leave work. This should not be a spur of the moment decision. Make sure that all involved are fully aware of all the benefits and entitlements that are due. This can be a very complex area so ensure that you get good advice.